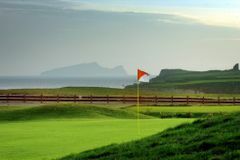 With it situated on Dingle Peninsula, this is Europe's westernmost golfing venue. However, Dingle's remoteness is more than compensated by its rugged charm. From this outcrop you can see the whole of the peninsula, with its enchanting whitewashed fishing villages and imposing mountains. Also visible are the towering Blasket Islands in the Atlantic, whose hardy population finally jumped ship for the mainland in 1953. Around the area there are many historical and archeological sites to experience, but they all pale in significance to the magnificent championship links golf course. Every hole is individually created from the fantastic landscape, but all encompass the same sandy seaside turf. Expect no airs or graces at Dingle, this is one for the purists.